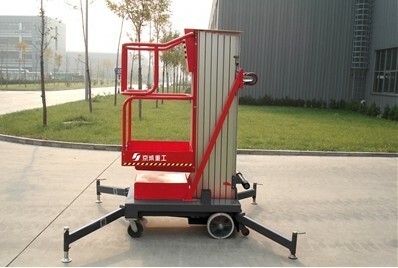 Equipped with hydraulic and chains lifting mechanism, and high strength welding steel frame, high strength aluminum column, single-mast aluminium work platform GTS6KJ08 is intensive. Both of the platform/ground control panels are safety voltage. The double column lift simultaneously, controlled by limit switch, and towed by two chains to ensure safety. It is widely used in indoor and outdoor cleaning activities, such as ceilings, walls, windows, pipelines and exhibition build-up.